April 2007 – Route 79 Journal . Even through the haze of an uncharacteristically warm April evening from about 1000m above the ground over central London, it was quite easy to spot where home is. Click-and-hold your left mouse button on the picture below to see how. My home neighbourhood is just about 1 click North of that and a fraction of a click to the right. And whilst I’m here, for those interested in all things mobile (cellular), there is an excellent weekly roundup of the best of the “mobile blogosphere” at the Carnival of the Mobilists, which (this week) is being hosted at the Mobile Marketing & Spam pages edited by Troy Norcross. There is a little suburb of London called Pitshanger. It’s in the West London Borough of Ealing. There is a doner-kebab shop there called West Kebab, which in my opinion is the best doner-kebab shop in London. And I went there especially to eat doner-kebab for lunch the other day. But because it was quicker to get there by car than by bus, I had to drive, and this meant finding a place to park in a side-street just off Pitshanger Lane. 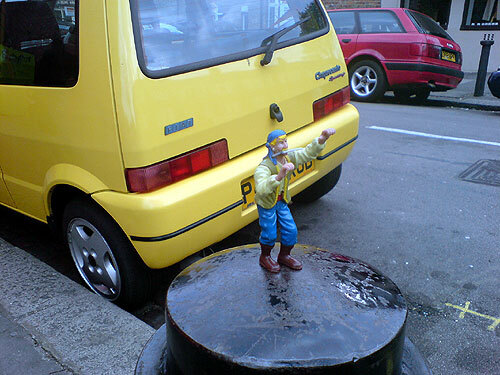 I spotted a little action figure placed atop a bollard in the street. In a strange sort of way, it’s quite a delight to see such a sight. Of course, I didn’t touch it. I just snapped the spectacle with my cameraphone. Pitshanger Lane is quite busy with people walking about at a lunch time, especially as it is school Easter holidays here in UK at the moment. So I kind of expected that it would disappear after a while, e.g. get picked up by a passing child etc. But about half an hour later, having fulfilled myself on a medium-sized doner-kebab with a full-works salad, chillie sauce and diet coke (diet coke and chillie sauce is an explosive combination by the way), I walked back to my car and noticed that it was still there. Why is it that little things like this make you feel good? I was thinking about this whilst on the top deck of the bus on the way home the other day. 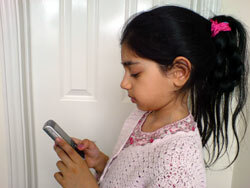 Have you ever seen anybody making a video call to someone using their mobile phone? I mean really making one, not just testing it out for the first time, but really doing it, like“in the wild”; i.e. on the street, on a bus, in the pub? Video calling was meant to be one of the reasons why billions of pounds/euros/dollars were spent by the mobile phone companies building new “3G” (3rd generation) mobile networks over the last few years. So now that “3G” and phones with video calling have been around for a while there should be a sufficient number of people with video calling capability in their pockets for us to be able to make a reasonable guess as to its popularity. But my personal observations tell me that despite the fact that people have it, people just don’t do it. Video calling that is. Many commentators in the mobile phone industry have given many good reasons why people just don’t do it. And I’ve studied those reasons. Pondered at them. Thought about them hard. And whilst I agree that many of the reasons given definitely have something to do with it, there is one reason that is never quite given. In my own view, it’s the real reason why people don’t do it. Or rather the real reason why people won’t do it. Even if all of the other reasons, issues and problems were taken away, there is is one reason why people will not do video calling on their mobile phones. It’s not just the fact that you turn off the 3G capability on your 3G phone in order to conserve battery life. (Most people I know who have 3G mobile phones do this!) No, it’s not just about that. It’s not just about the fact that it’s sometimes more expensive to make a video call compared to a normal “voice only” call. And it’s not just about the fact that you never quite know if the other person you wanna call has a 3G video calling phone, and is in an area with 3G coverage and hasn’t switched off their 3G capability in order to save battery life just like you do. No joke. It’s a classic case of bad usability. With the help of my most gracious model above you can see that the most natural holding position of a mobile phone is the position that we all know very well; the phone is a comfortable distance away from the face so that she can see what’s on the screen clearly, and her arm is comfortably bent at the elbow, with the elbow resting against her side. 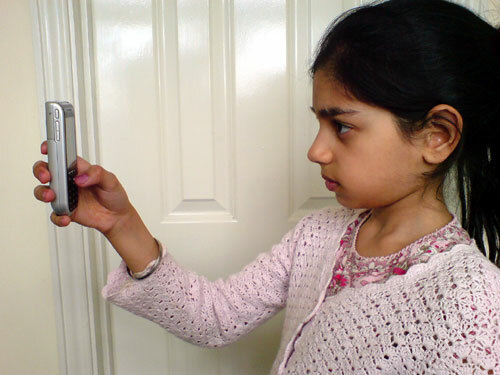 The net result of this completely natural and comfortable way of holding the phone is that the video calling camera on the front side of the phone is now at an angle which is acute to the horizontal plane of her face. 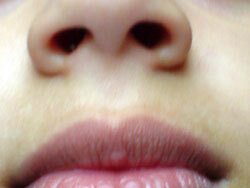 Which means that if you were lucky enough to receive a video call from her, you would get a great view of her nostrils – in extra wide-angle perspective. And she would see herself in the corner of her screen and probably go “eeuugghh“, and compensate for the fact she’s looking like that by extending her arm out so that the phone camera is now in the horizontal plane of her face. Like below. Video calling requires you to hold your phone out in the horizontal plane of your face. The problem with this pose is that it’s unnatural, and uncomfortable and requires a dramatic extension of personal space. And won’t last for very long. Your arm will get tired very quickly, and when done in public, your spatial self-awareness will cause a tendency to resist it. And so it will be the reason why video calling will never be as popular as regular calling, even if all the other problems were solved. In my view it will be the reason why most people will just not do it at all. This posting featured in the Carnival of the Mobilists weekly mobile blog-news roundup number 69 at Mobile Marketing and Spam on April 16th 2007. 20 Comments on Video calling anybody? WARNING: techie posting: I finally got myself an invitation to be an “official beta tester” (yeah right) of a new piece of Internet-ware called Joost. From the people who brought us Skype. Its overall aim is to take “all the magical bits of television, the even better bits from the Internet, and mixes them together so that you can watch what you want, when you want in full screen high-quality proper TV”. Watch the official promotional video here. Joost. Beta-stage Internet & TV mashup with community-like features. I must say that the user interface is quite beautiful and very simple to use. It’s starts in full-screen mode and I was quite amazed at the quality of the picture in most cases, although you can spot the compression artefacts sometimes. You can browse through channels and also browse through what’s on in a very simple to use on-screen display which is sumperimposed over what you happen to be watching at the time. You can also “search” the programme listings. The channels are currently a bit obscure, although there are some familiar names amongst them. And then the programmes within the channels themselves are also quite obscure, but nevertheless of reasonable to good viewing quality. For example there appear to be some independently-produced Sci-Fi shows that probably don’t get much “real TV” airtime, and some live London rock/pop concert footage that were probably made for Internet viewing. There is no timed schedule as such; instead the programmes just carousel through the channel you select. All in all, it’s a very well executed concept and as the channel and content lineup improve over time I think it could be something very significant. Yes, however, but …. unlike Internet radio stations which you can happily have on in the background whilst you are using your computer to work or perform other tasks, Joost is TV, and much of the content requires “user engagement”. Which means you have to concentrate on the show in order to enjoy it. Now I don’t know about you but sitting on my swivel-chair and staring at my laptop screen on a desk in the corner of my bedroom is not exactly my idea of watching TV. There’s a nice sofa and larger TV screen and surround sound downstairs for easy viewing. Also, there’s a portable TV in the kitchen that gets used for 90% of the viewing in our house, because the kitchen is where most of our time is spent. I can’t see myself taking my laptop into the kitchen to watch Joost instead. Also, I did some technical analysis of the effects that Joost was having on my laptop computer and broadband Internet connection. Specifically I wanted to understand why my laptop fan was kicking in. The fan comes on when the processor starts to run a little hot. 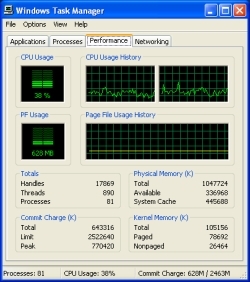 So I went into Windows Task Manager to see how much of my laptop’s CPU Joost was consuming. 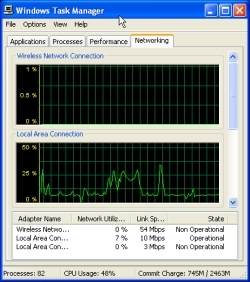 The Task manager also allows you to get a view of how much instantaneous bandwidth is being consumed on your broadband connection. Now, my laptop is not a wimpy one by any means. It’s a top of the range Toshiba Tecra with Intel core duo processors and 1 gig memory. And for these performance tests I used a fixed 10Mbps Ethernet connection against my 8Meg broadband link to the Internet. Couple of screenshots below. As you can see, Joost was taking about 25-30% of my CPU power and an average of around 6% of my broadband capacity, peaking up to around 25% on some occassions. The net effect of the CPU impact was the fan in my laptop was switching on and making a noise and the gadgets on my desk were getting hot as a result of the hot air being blown onto them. So I had to open the window to get some cool air to circulate the room. And between 6% to 25% of the broadband capacity might not sound a great deal, but when you translate this into megabits per second, 6% is around 600kbps which is what you would expect in order to account for the decent video quality you’re getting with Joost. (In fact it’s quite remarkable that it’s only around 600kbps that delivers such good full-screen viewing quality!) However, even at 600kbps – that’s 73 kilobytes per second, which is about 130 megabytes per half hour viewing. Nine such viewings will take you to one gigabyte. People on a limited data transfer broadband package better be aware of this. For example here in the UK, Sky’s free broadband package has a monthly data transfer limit of 2 gigs. That will get used up in less than 9 hours of Joost viewing. And a Happy Easter to all those celebrating. Click where it says click here and experience the repetitive mundanity of it. Vocal loop is the beautiful voice of Shreya Ghoshal.